The Progress-Focused Approach: Solution-focused practice in groups: room for ruminating on problems? Solution-focused practice in groups: room for ruminating on problems? "I've had great success by leading with SF questions and techniques. By immediately focusing on where we're going, I've been able to set the right tone. On the other hand, I can tell that some people are disappointed that they didn't get a chance to ruminate on problems. Anyone else experience this?" "Interesting question. Yes, I have had this experience too. Over the years I have picked up a few things that helped. It may help to give people some room to express complaints, disappointments, etc. But it can be dangerous to let them do that in the group because that might take away enthusiasm of others. A solution that often works is to parallellize the process. For instance, you ask them to write down answers on yellow post-its to questions like: 1) what does not have to change because it is already going well? 2) what are you not yet satisfied about/what would you like to see different? 3) what ideas do you have about which contributions you might have to establishing the goal of .... 4) what ideas do you have about how we can make this session as useful as possible. 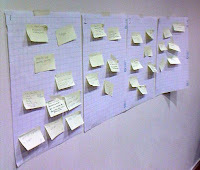 You invite them to put their post-its on the wall when they have answered the questions. As a facilitator you can select a few items to discuss in the group. Usually the majority of the responses will be very constructive and realistic. Of course you can use your SF skills (like normalizing, reframing, etc.) when dealing with some complaints. The advantage of this kind of approach is that everyone can express their feelings and ideas regardless of where they stand without much risk of negativity dominating the process. I hope there is something of use in these ideas for you."